Hope it stops by the time i get to Cali! That's a bit close for comfort. Our donkey shed was completely demolished by stupidly high winds a couple of weeks ago. Won't get repaired until after we've finished harvesting though. Looks like they're going to get a new house for Christmas. That looks quite close! Hope you and your chicken are ok! 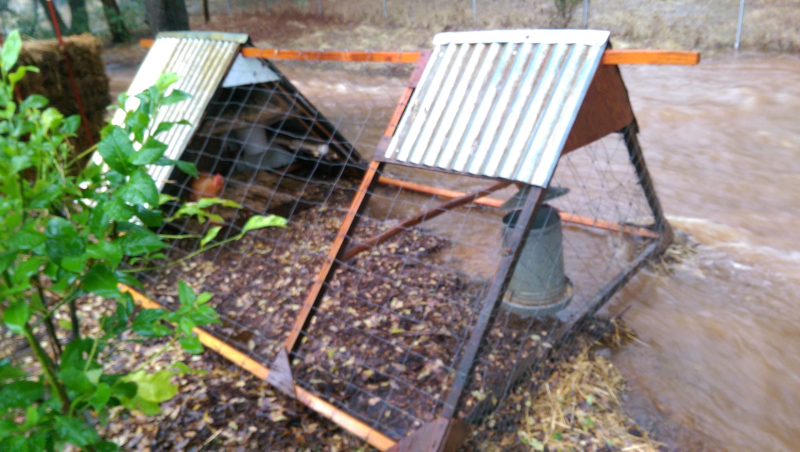 Fortunately, I have recently switched to a movable chicken-tractor style coop (you might notice the handles sticking out at either end of the coop). Two people can move the chicken-coop to various places on the property.